Men walk on a damaged road in the Petobo subdistrict on Tuesday, days after an earthquake and tsunami hit Palu in Central Sulawesi, Indonesia. Up to 1.6 million people may have been affected by the 7.5-magnitude earthquake and tsunami, the U.N. Office for Disaster Risk Reduction said. The U.N.'s relief agencies are working to help those in Central Sulawesi. So are agencies based in Europe and the U.S. Agency for International Development, which says it has "a team of disaster experts on the ground" to assess the damage and help coordinate the response. If you'd like to help, we've compiled a guide to some of the organizations working in Indonesia, below. It's not an exhaustive list; for more resources, see an article in The Jakarta Post that lists more options; it was recommended by a government official who is handling aid donations from corporations. Indonesian Red Cross — The group says it has sent as much as 70 tons of supplies and vehicles to help the relief effort in Palu and Donggala: from baby kits, mattresses and tents to water trucks and other heavy equipment. According to the American Red Cross, "More than 179 volunteers and staff from the Indonesian Red Cross are currently on the ground.... The Red Cross also sent 15 ambulances and 22 water trucks." The American Red Cross has a Charity Navigator score of 84. CARE says it is focusing on the Donggala area, north of Palu and closer to the epicenter. "Our goal is to get to those survivors to provide life-saving drinking water, shelter and proper sanitation," explained Helen Vanwel, CARE's country director in Indonesia. "Still, access to these areas is severely limited. A landslide has blocked the main road into Palu, flights are restricted into the airport, there is a destruction of major seaports and a general lack of communication." Its Charity Navigator score is 87. GlobalGiving — The organization, which funnels donations to local organizations, has raised $30,000 of its $1 million goal to help people in Sulawesi. The effort centers on emergency supplies such as "food, water, and medicine, in addition to longer-term recovery assistance to help residents." It has a 96 rating on Charity Navigator. Humanity & Inclusion — Along with helping displaced people, the group says, "we expect to come across large numbers of injured people in need of urgent medical care and rehabilitation. HI has worked in Indonesia since 2005, when it and others responded to the December 2004 tsunami disaster. Formerly known as Handicap International, it has a Charity Navigator rating of 89.
International Medical Corps says, "we now have people in Palu who are conducting assessments, while our team in Jakarta continues to meet with government officials and other partners to work on how to best address the needs of people affected by this disaster." The Los Angeles-based group has been working in Indonesia since 2000; its Charity Navigator score is 84. The American Jewish Joint Distribution Committee (JDC) — The group is providing "emergency medical services, critical supplies, and psychosocial support with one of its longstanding local partners," in the wake of the Sulawesi catastrophe. 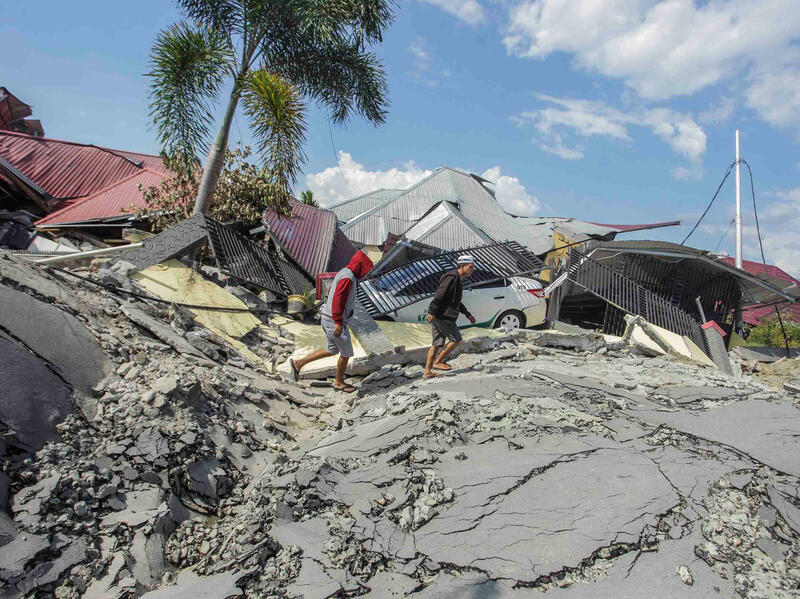 Like other groups, it has also been working to help the response to a deadly quake in Lombok, an island to the south. The JDC's Charity Navigator score is 93. Oxfam says it's working with partner organizations to scale up its response to support 500,000 people, as estimates of the damage and loss of life have continued to grow. "More than 300,000 people are thought to be homeless," says Ancilla Bere, Oxfam's Humanitarian Manager in Indonesia. Oxfam America has a Charity Navigator score of 85. Mercy Corps — The group's staff began to arrive in Palu on Tuesday. In an update from the stricken city, a Mercy Corps team member named Arianto said: "The situation in Palu remains grave. Food and water is scarce and many of the people I have spoken with haven't eaten in days — and that is the situation in Palu, a city which is receiving support. People at the epicentre of the quake are still largely cut-off from the aid effort." Mercy Corps' Charity Navigator score is 87. Save the Children says it is working with its local partner, Yayasan Sayangi Tunas Cilik, trying to minimize the psychological and physical toll on children, "particularly those that were orphaned or separated from their parents" after the earthquake and tsunami. At least 600,000 children were affected, the group says. Its Charity Navigator score is 88. UNICEF Indonesia says it is "working with authorities to reunite unaccompanied and separated children with their families, support infant and young child feeding, provide clean water through mobile water treatment, and help children recover." The effort includes is working with local authorities to help family members find each other. The group's USA body has a Charity Navigator score of 82. World Vision Indonesia — The aid group says, "Our staff are already on the ground, providing infants and children with food. Tarpaulins and blankets have also been given to people in need of emergency shelter." It adds that it hopes to reach 80,000 children and their families. The organization earned a Charity Navigator score of 86. Google Indonesia has launched an open course web application Google Person Finder to help people locate their family and friends affected by the natural disaster. Facebook has also created a Crisis Response Page, allowing people to mark themselves safe from the disaster.